Last week I shared my Chinese Chicken with Walnuts recipe and received quite a few emails with questions about the how-to’s of stir-frying. So, I thought I would give the basic information that I have learned and hopefully encourage you to give it a try! a pair of Chinese cooking techniques for preparing food in a wok: chǎo (炒) and bào (爆). The term stir-fry was introduced into the English language by Buwei Yang Chao, in her book How to Cook and Eat in Chinese, to describe the chǎo technique. The two techniques differ in their speed of execution, the amount of heat used, and the amount of tossing done to cook the food in the wok. The chao technique is basically using a wok with a small amount of oil poured down the side, adding the dry seasoning like ginger, then meat is added and seared and finally the thinly sliced vegetables are added along with any seasoning sauce. The meat is normally removed before the vegetables are added and added back in once the vegetables are cooked. In the bao technique, the wok is heated very hot, oil is added with the meat and then the vegetables quickly. The ingredients are tossed quickly only pausing to add new ingredients. Basically, stir frying is cooking vegetables and meats in a wok over high heat in oil while stirring constantly to provide even heating. The most time consuming part of stir frying is the preparation and it is important to have all ingredients ready to facilitate quick cooking. This means that you should spend time chopping all the vegetables and meats, as well as, prepare your sauces before you start cooking. Unless you are following a recipe that specifies otherwise, cut all ingredients about the same size for even cooking. Once you are ready to begin, preheat your wok for a minute or so and then add several tablespoons of oil. Once you add the oil, swirl the wok to coat the sides – be careful, it’s hot! Since great stir fry is cooked quickly over high heat, be sure not to overload your wok with ingredients which results in cooling the oil too much. This is my biggest problem! For all the Chinese stir fry recipes I give, I normally quadruple the amounts listed and being an impatient sort, I want to cook it all at once. The results are much more authentic when I don’t! Doubling the recipe works since I have a large wok, but like I said, I want to get ‘er done! Meat is normally cooked first and then removed and set aside until the vegetables are cooked and then added back, as in Chinese Chicken with Walnuts. This keeps the meat moist, prevents overcooking and helps keep the individual flavors of the ingredients. To stir fry vegetables, start with the denser vegetables like carrots or broccoli since these require a longer cooking time. Typically the vegetables are cooked until lightly crunchy. When the sauce is added, scoot the vegetables and meat up on the sides of the wok forming a well in the center. Add the sauce to the well and stir until thickened before mixing with the rest of the ingredients. As I shared last week, when I began cooking Chinese food, I was blessed to have a Chinese-American friend who shared her recipes and tips with me. I first started stir frying by using what I had, a 6 qt. boiler and while it worked, once I purchased a wok, Chinese cooking was much easier and tasted more authentic! The wok has a rounded base and is used with a wok ring which gives the wok stability. Even heating is facilitated with a wok along with increased ease of stirring the vegetables and meats. I personally have not purchased any special knives for stir frying but good kitchen knives are important – not only in Chinese stir-frying but also to make your job in the kitchen easier! My favorite knives are from this knife set. These knives are not expensive and have stayed sharp for several years and I use them daily. When I first began stir frying in my boiler, I used a regular slotted spoon. But when I bought my wok, I also purchased a bamboo stir fry spatula and being under $5, it was well worth the money spent! It’s shape allows for much easier stirring around the wok’s rounded bottom which helps keep the food moving and heating evenly. I do have to add, I do not reserve this for just stir frying – it has become a well used kitchen utensil! The ingredients for stir fry vary depending upon the recipe but most will consist of meat (pork, chicken, beef, seafood) and vegetables. I have used both fresh and frozen vegetables when stir frying and both work well. 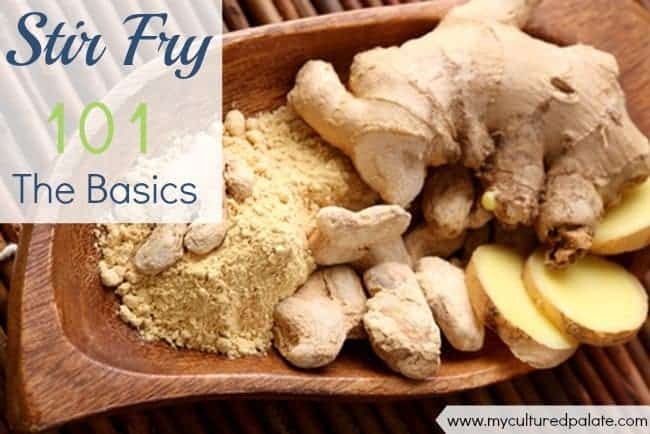 Garlic, ginger, soy sauce, vinegar, wine and egg are all commonly used in stir frying. Fresh spices are preferable but powdered garlic and ginger will also work well in a pinch. I purchase my spices in bulk (and save money too!) from my affiliate, Wilderness Family Naturals which carries high quality, non-irradiated products. If you are on a gluten free diet, be sure to use gluten free soy sauce. I have been using Bragg’s liquid aminos as a substitute with great results. Cornstarch is another common ingredient in Chinese stir fry dishes. Arrowroot powder may be substituted in equal amounts. There are 2 brands that seem to be reliably non-GMO cornstarch products– Rumford’s Cornstarch and Rapunzel Organic Cornstarch. I have found Amazon to be more economical for non-GMO cornstarch rather than any place locally. Since stir fry is done using high heat, the oil used should have a high smoke point. The smoke point is the point at which the oil begins to break down potentially causing carcinogens and imparting a bitter flavor to the food. The most commonly and traditionally used oil for stir frying is peanut oil, not only because of its high smoke point, but also its nutty flavor. If, however, you are allergic to peanuts, coconut oil or olive oil may be used. Give Stir Fry a Try! I have tried to give the basics of stir frying and encourage you to give it a try. Our family really enjoys stir fry whether it is chicken, beef, pork or seafood. I normally serve stir fry dishes with rice for a healthy easy to prepare meal. If you have a favorite stir fry meal, leave a comment and share it!